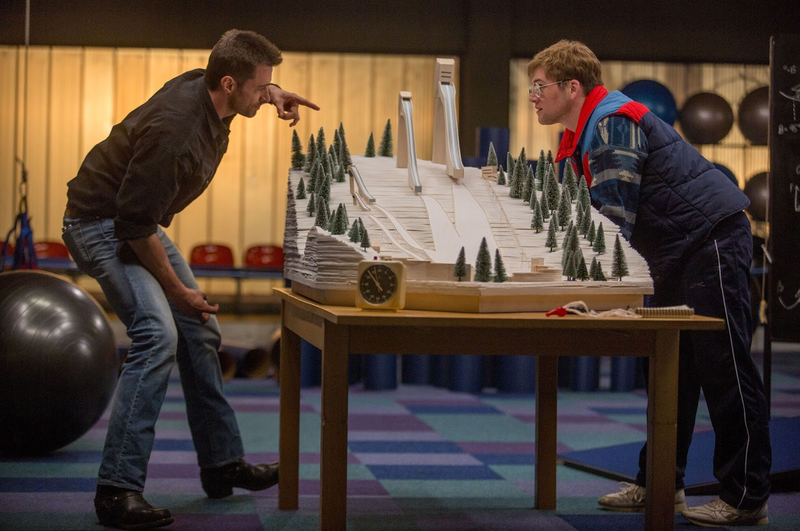 If there's a new drinking game created for every fictional detail in the new Olympic film "Eddie The Eagle," audiences may be passed out under their seats by the time the first ski jump appears. But if five-ringed fact checkers (and anyone with common sense) are willing to leave the nonfiction elements of Olympian Michael "The Eagle" Edwards' real story at home, viewers may find a lot to enjoy during this feelgood spectacle. Edwards, of course, was a Team GB athlete who competed in ski jumping at the Calgary 1988 Winter Olympic Games the same year Finland's ski jumping phenom Matti Nykänen defended his gold and silver medal jumps of Sarajevo. Similar to the debut of the Jamaican Bobsled team, Edwards' jumping feats played more like comic relief for sports reporters and fans who tensely awaited that Olympiad's on-ice "Battle of the Brians" (Boitano/USA v. Orser/Canada) and the "Battle of the Carmens" (Witt/East Germany and Thomas/USA). In his spare time (and the nine unemployed months without snow), the same former champ works on an expensive old (and gold) Pontiac Firebird Trans Am in his garage apartment ... in the German Alps ... and he drinks heavily before soaring off the 90 meter ski ramp sans helmet/coat for a flawless landing! (I chuckled as this heavy-CGI scene includes the jumper flicking his smoke like 'The Fonz' during a windy descent -- in some ways this scene was the film's "jumping the shark" moment). I honestly don't know what path the real Edwards officially took to qualify for Calgary, but I doubt the real-life British Olympic Association leadership, or their sportsmanlike Olympian team members, dished out as much baloney for Edwards to clear like hurdles on a track. It was laughable that working media and the Team GB publicist donned no Olympic credentials, and both seemed to enjoy unfettered access to Edwards in the Olympic Village and ski jumping field of play. 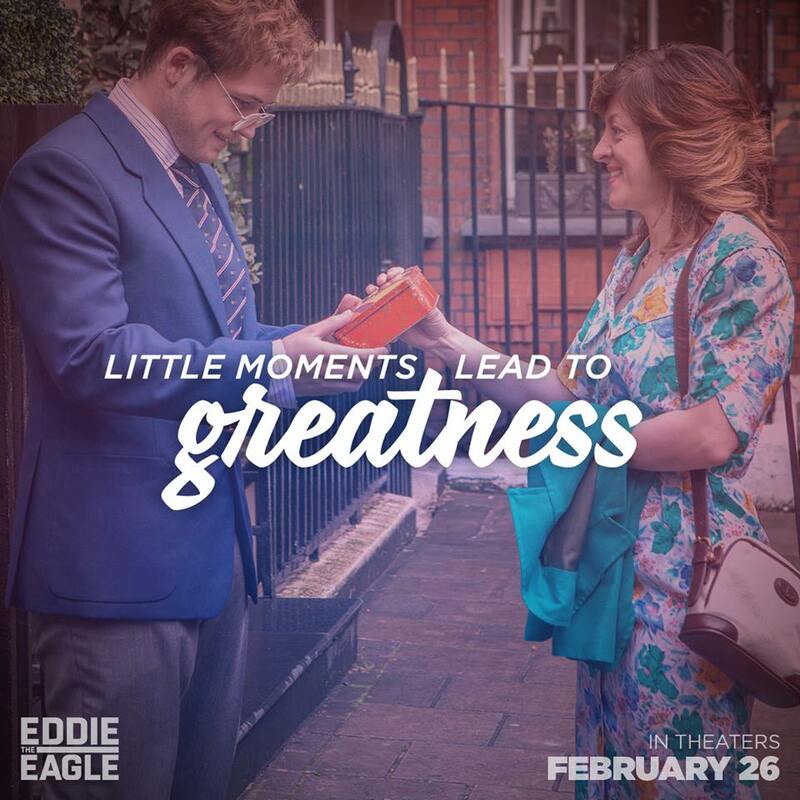 In spite of these glaring flaws, I laughed out loud and found myself smiling through much of "Eddie The Eagle." It was easy to cheer for underdog Edwards in 1988, and even easier with doses of humour akin to favourite scripts appearing on the BBC. 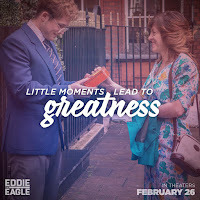 Scenes featuring a young Eddie studying Olympic history books brought back childhood memories, as did mother:son moments of encouragement featuring a keepsake biscuit tin. It was also fun to see actual ABC and I.O.C. footage from the '88 Opening and Closing Ceremonies, and a true Edwards cameo during the organizing committee's closing remarks. 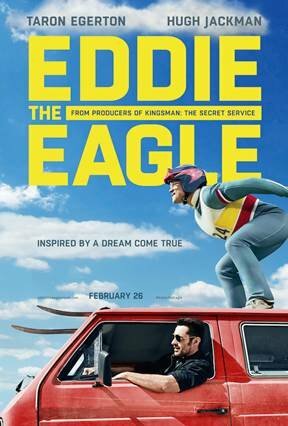 Another plus for "Eddie The Eagle" is its excellent score, which I understand was composed by Matthew Margeson -- the music really makes the movie at many critical moments, and a few perfectly-timed bars of a specific Van Halen hit had the audiences loudly cheering in the theatre and on screen (turns out most of the soundtrack is original music created to accompany the film). Holly Johnson's "Ascension" (Fly) is good as well. Comparing notes with several Olympic-minded friends, it was unanimous "Eddie The Eagle" is a crowd pleasing film, and probably its strongest asset is the seamless special effects, POV shots and Go-Pro camera angles that seem to take the audience off of several of Europe's top jumping centers (the film crew did not visit Canada, but they did turn a modern European jump site into a fully-dressed Calgary Olympic venue). Perhaps only the famous "Thrill of victory and the agony of defeat" video gives a more breathtaking look at ski jumping, and it surprised me this "Wide World of Sports" intro did not make the cut (then again, "Eddie The Eagle" was -- perhaps deliberately -- not a Disney/ABC production). Olympic pin collectors may find themselves pining for one of the Team GB costume pins (a fictional design almost two inches in diameter). And Christopher Walken fans may find themselves wishing to read his coaching manual after a locker room reunion with his bad boy protege. British character actor Jim Broadbent also logs a fun cameo as sportscaster, a turn from his appearances in "Iris," "Moulin Rouge!" and the Harry Potter franchise. I scratched my head at the PG-13 rating for "Eddie The Eagle" as there is zero profanity and less smoking or 4:20 references than viewers may recall from "Cool Runnings." 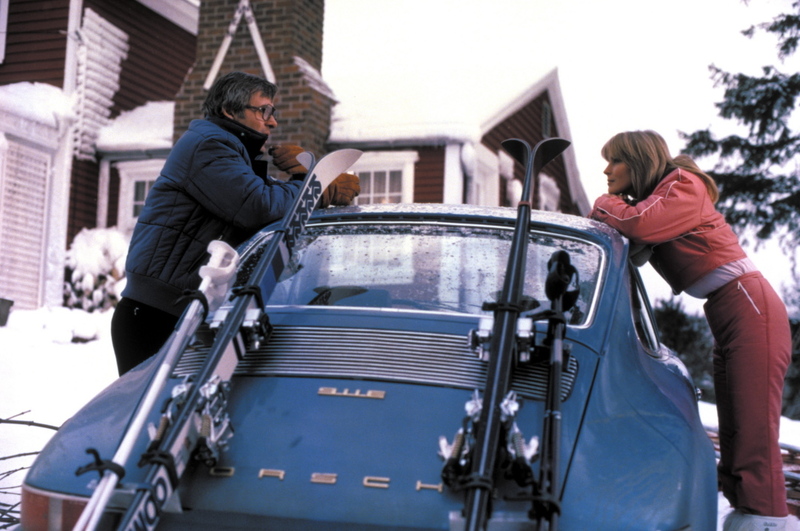 featuring Bo Derek and skis. Granted, John Candy was more of a teddy bear coach in the 1993 film, and friends reminded me of Jackman's unconventional coaching scene during which Edwards is instructed to fantasize about Bo Derek. This part of the script earned a three not a "10" in my book, but somehow that must add up to PG-13. Maybe some unsportsmanlike conduct, or a scene involving Norway's jumpers in a sauna, also gave the MPAA cause for pause. 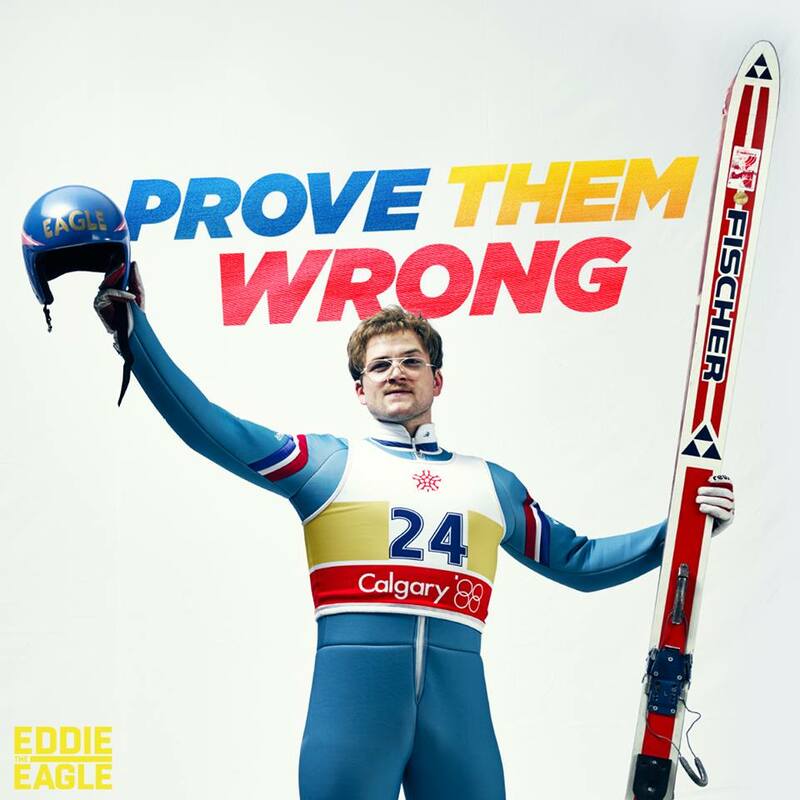 No matter the rating, if you want to enjoy a few winter Olympic laughs, take the plunge and go see "Eddie The Eagle." Even the trailer (below) may make you jump for joy.